Canberra Theatre Centre in conjunction with Libraries ACT are conducting free interactive story times during the 2019 season. This is a great opportunity for kids and their parents to reacquaint themselves, or even discover these children’s stories before seeing the shows live on stage! During each session there will be interactive readings from passages of the books followed by an activity. 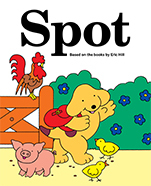 All of these interactive story times are FREE but bookings are essential to secure your spot. Simply just go to the “What’s On” page on the Libraries ACT web site and select the event and location you’re interested in to secure your spot. 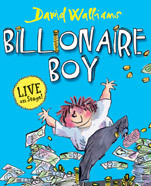 David Walliams’ best selling books comes to life on stage for 6-12 year olds – and their adults! 12 year old Joe has everything a boy could ever want, from a golden underwater Ferrari to his very own cinema. Joe and his Dad have more money than you could imagine, but what Joe really needs is a friend. When Joe arrives at his new school, life really gets tough. Facing the school bully, his Dad’s new girlfriend and the world’s worst school canteen, Joe is about to learn that money might buy you a lot in Raj’s shop, but it can’t buy you everything. Live Show 23 May – Book Now! 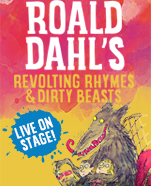 Roald Dahl’s Revolting Rhymes & Dirty Beasts bursts off the page in a spectacular new live show, taking the world’s best-loved fairy tales and rearranging them with some surprising and hilarious twists. Seriously funny and frighteningly silly, Roald Dahl’s Revolting Rhymes & Dirty Beasts is the perfect show especially for children 5 to 105, that’s sure to delight and disgust in equal measures. Don’t miss this multi-Helpmann Award nominated production penned by the world’s number one storyteller and from the team that brought you George’s Marvellous Medicine. Live Shows 3 to 6 July – Book Now! 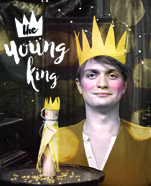 The Young King tells the story of a young boy born to a princess and a poor woodland man. Snatched from his parents as a baby, the Young King is raised by a kindly goatherd in a deep forest. Years pass and the old King, father of the princess, nears the end of his life. The old king calls for the boy to be brought to the palace; there he tells him, “You are not a young goatherd, you are my grandson the Young King and heir to my throne”. The achingly beautiful and tender language of Oscar Wilde joins the intimate and magical world of internationally acclaimed Adelaide theatre company, Slingsby. Journey in wonder, to a land of challenging choices and rich rewards. Live Shows 11 to 13 July – Book Now! 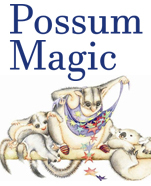 For more than 30 years, Mem Fox’s Possum Magic has captivated and enchanted young people all over Australia. Grandma Poss loves making magic. She makes wombats blue and kookaburras pink. She makes dingoes smile and emus shrink. But one day, when danger arrives in the form of a snake, Grandma uses her most magical spell to make Hush invisible. Possum Magic takes us on a whimsical journey to cities around Australia to find the food that makes Hush visible again. Joined by an extraordinary creative team, Monkey Baa brings to life the characters, journey and love that has made Possum Magic the most-loved and best-selling Australian picture book of all time. Live Shows 7 September – Book Now! A cast of three use songs, live action and beautiful puppetry to bring Eric Hill’s beloved puppy to life on stage! Live Shows 30 November – Book Now! Sign up to our mailing list and be one of the first to access pre-sale tickets, announcements, offers and more.